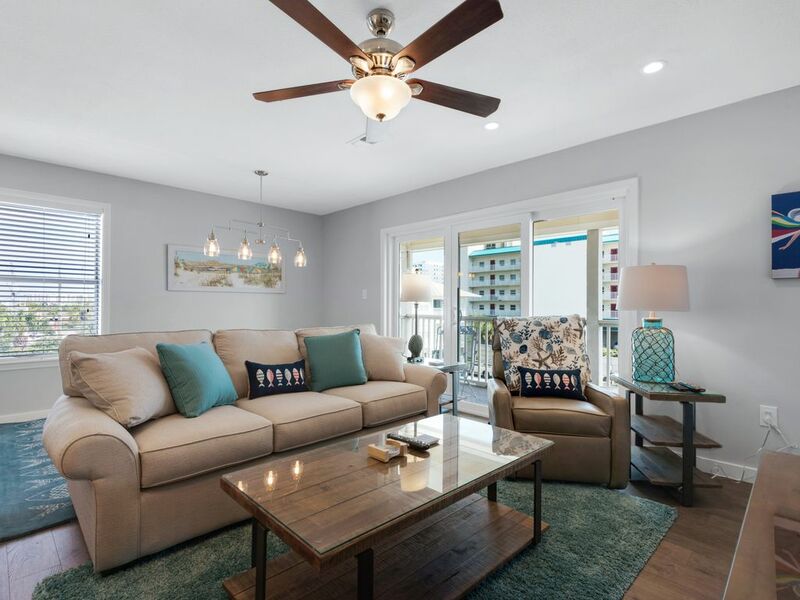 Located just a short walk away from the beach, newly remodeled Unit #433 at St Martin is the perfect place for your next getaway to Destin. This three bedroom, 2 bath condo has been professionally decorated. It is 1100 sq feet and can accommodate up to 8 guests. It has a king in the master bedroom, a queen in the second bedroom ,a double with a twin bunk in the third and a queen sleeper sofa. The unit has been professionally decorated and includes granite countertops and stainless steel appliances. After a day spent on the beach, relax on the private balcony of your Destin, Florida condo rental. This three-story, low rise complex offers a community pool and community barbecue grills. Location, Location, Location.Centrally located to ocean, water parks, shopping , restaurant. New in 2018. High end furnishings and appliances. Large Balcony. Communal grills . one and half block from ocean . deeded access to beach . one guest estimated that walk was the length of football field from unit. about 5 mins. The villa was beautiful and had everything we needed. The walk to the beach was not far. Deann was very responsive when I asked for more information. A pleasant stay! This property is a jewel among the many to choose from in Destin, FL. Among all the crowded high rise condos on the coast is this quaint villa. Everything you need is available to you from a stocked kitchen, to linens, and comfy beds. You are steps away from a gated boardwalk with private beach access. The unit is newly remodeled and decorated nicely. WiFi and TVs for when you are forced inside, and a pool right downstairs. The owner was quick to answer any questions, and provide tips. Easy to work with and very accommodating. We had a family of 5 and it was plenty big for us. Will stay again when we are in Destin. Rented the house to do some fishing in Destin and the unit was perfect. Very well maintained and owner was very responsive. Can’t go wrong with this place! We thoroughly enjoyed our stay here, and we would love to come again in the future. DeAnn's place was immaculate and decorated beautifully. Everything we needed was close, and in walking distance. A huge souvenir shop practically next door, a grocery store across the street, the ocean less than a 5 minute walk, and a nice pool a few steps away. This was a very relaxing vacation, and one of our favorites. Loved the Villa, all the comforts of home! Can’t control the weather, cloudy/foggy the whole week. Maybe should come later in the year. We rented this place for a girlfriend getaway. It was perfect. Very very clean. Beautifully decorated. Walking distance to the beach. Restaurants and nightlife very close by. Highly recommend this place! Approximately 100 yards from the beach. One guest estimated a 5 minute walk.. Located aross from Big Khuana Water Park, one mile from Silver Sands Outlet Mall. the Villa is in Building 4 at St Martin Beachwalk.. It's balcony faces the pool . There is NO ELEVATOR, unit is located on 2nd floor. 2 short flights of stairs. This unit does not have a beach service contract , but the beach chairs and umbrella are available for rent. Price as of June 2018 was 30 per day.